Borderlands fans might still be waiting for the Borderlands 3 game to roar into view, or continuing to anticipate the announced, but without a date so far, film adaptation but we’re bringing them something they can get excitied about - right now! This second series of Borderlands POP! 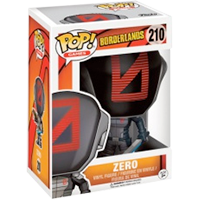 will expand the characters that make-up the Borderlands collection, as well as a super-cool Emperor version of best-selling Claptrap, we are also releasing Tiny Tina, Lilith and Zero. The first series sold very well and with nearly 30 million of the games sold to date this has a very strong, and loyal fan-base. The Zero POP! vinyl figure stands around 9cm tall.